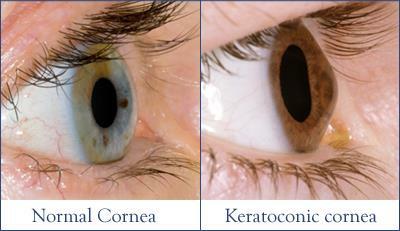 Keratoconnus is a condition of the eye in which the normally round cornea becomes thin and bulging like a cone. 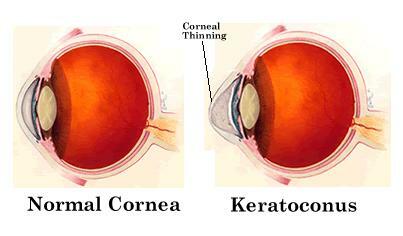 The cause for Keratoconnus is unknown. It usually starts in the late teens to early twenties and may continue for several years. Corneal Cross Linking (CXL): Also known as Corneal Collagen Cross Linking .It strengthens the corneal tissue to halt bulging of the eye’s surface in Keratoconus cornea. Gas permeable contact lenses: These are a kind of contact lenses that are rigid gas permeable that are placed over the cornea thereby replacing its irregular shape with a smooth, uniform surface for better refraction that improves vision. This will help correct vision as keratoconus progresses. Intacs: Intacs are inserted into the mid layer of the cornea to flatten it. This changes the shape and location of the cone. Topography guided conductive keratoplasty: This treatment uses energy from radio-waves taht are applied with a small probe at several points in the periphery of the cornea to reshape the eye’s surface. A topographic map helps to create the image of the eye’s surface to customise the treatment plans. Corneal Transplant: Few people can’t tolerate the contact lenses or other therapies to get normal vision and in advanced cases corneal transplant is considered. In cases of severe keratoconus this might be the last resort. Eye glasses or soft contact lenses: It can be used to correct the mild nearsightedness and astigmatism caused due to keratoconus at an early stage. What are the tests for diagnosis of Keratoconus? Slit lamp examination: An examination to check your eyes for any abnormalities. Keratometry: It is a diagnostic instrument to measure the curvature of the anterior segment of the cornea, particularly for assessing the extent and axis of astigmatism. Corneal Topography: It is a method for obtaining three dimensional mapping of the surface of your cornea. Corneal Pachymetry: It is a test to measure the thickness of cornea. Advanced Eye Hospital and Institute in Navi Mumbai is equipped with one of the best eye hospitals in Mumbai. Comprehensive eye check-up and the operation theatres are state-of-art and equipped with the best diagnostic and surgery machines. Personalized care, infection free modular operation theatres and beautiful ambiance complement the cutting edge eye care offered at AEHI. Besides treating patients from Kharghar, Nerul, Vashi and Panvel, patients from all over western India travel to AEHI for world class eye care management.